It’s almost that time to join in for German Literature Month (now in it’s 5th year) hosted by Caroline and Lizzy. I honestly don’t know if I’ll be able to read much but I do always enjoy a good reading challenge. Here are the rules for the challenge: Whatever you read, in whichever language you read, must have originally been written in German. Novels, novellas, short stories, plays, poems, they all count. No genre is excluded. And, Enjoy yourself! And, if you have no idea where to start Caroline and Lizzy are doing themed weeks and readalongs. The Murder Farm by Andrea Maria Schenkel. This is crime novel based on a true account of a murder that took place in 1922 Bavaria. Berlin Tales by Lyn Marven. Seventeen stories that take you around the city of Berlin (which happens to be one of my favorite German cities). The Turnip Princes and Other Newly Discovered Fairy Tales. What you mean the Brothers Grimm aren’t the only German fairy tale writers? The Passport by Herta Muller. Winner of the Nobel Prize for Literature in 2009. Here Comes Mrs. Kugelman by Minka Pradelski. An enchanting novel of listening and telling, of the silence between Holocaust survivors and their children, and of the power of stories to mend broken bonds. These all sound so good that I want to read them now but first, I need to finish one of my R.I.P. reads before Halloween. 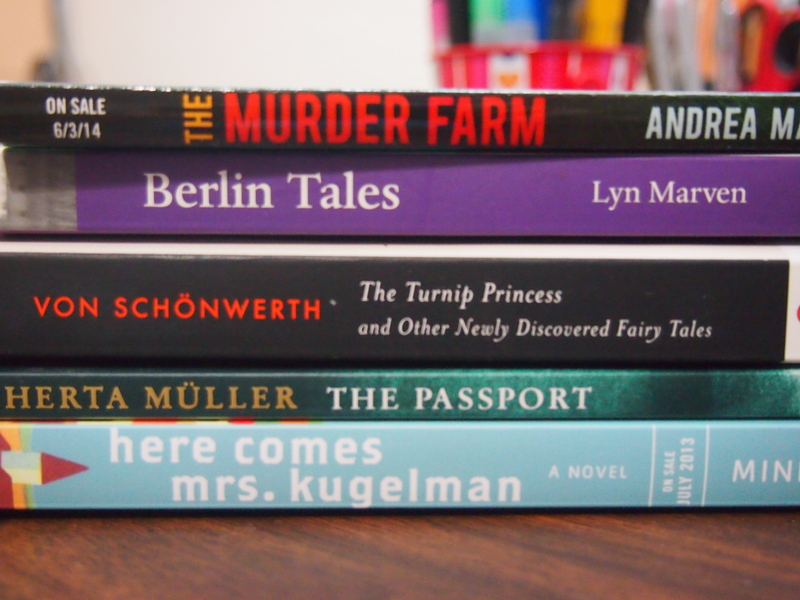 Anyway, who is joining in German Literature Month and what are you reading? 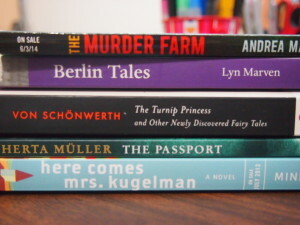 All of those books sound interesting, but Here Comes Mrs. Kugelman is the one that makes me most curious. I like the titles and want to know more! I think I will plan to join this one next year. I have my November mostly planned out for now otherwise I would jump in right away. I hope we have this event next year as well. In the meantime, looking forward to your reviews. Curiosity question for you. With all your trips to Germany over the years, have you learned the language enough that you might be able to read in it one day? Jenclair – I feel like that one has the potential to be a “must read with kleenex on hand” type of book! Athira – I totally understand. I am actually planning to join another reading challenge in November – yes, I’m crazy! ha. Hopefully the challenge will be back around next year again. Stefanie – I can understand quite a bit actually and maybe I could read a bit of a young adult/children’s book but not a novel. I really wish I could become more fluent but I feel like I’m stuck at a certain level. I keep telling my husband we need to speak German at home so I can practice! Literary Feline – Did you go check out your shelves? You should join in the fun too!